Well, I hadn't blogged in a few weeks and I really thought today I'd smash some posts together. Wrong. 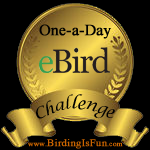 Thanks to my lovely, techie talented daughter Katrina, I got on a new mission to roll over my Bird Addiction Blogspot http://birdaddiction.blogspot.com/ to Weebly. Turned out to be a task that was easier said than done. Now that I have a few posts mapped and am getting the hang of things I thought I'd see how to add a 'follow' script. Turns out...I can't. Not yet anyway. I like the drop and drag functions of Weebly, but I would really miss my ability to track my new followers and follow fellow bloggers. So, the jury is still out. Just for pure unadulterated fun...I am going to move forward on the site build. Heck, I may decide it's a better format?! Hope that the RSS feed allows my blog friends to read along. Until then, happy birding and blogging.